As Argentina's port and capital, Buenos Aires welcomed all artistic and architectural European styles in a clearly cosmopolitan manner. The European immigrants who were to form Argentina's ruling classes brought with them examples and images from their home countries and introduced them into the city's districts. But the prototype city that took hold towards the end of the 19th century was French in influence, with the city's urban layout defined by large boulevards and avenues that provided wide perspectives and an architecture that was also inspired by the academic traditions of the Beaux Arts, in accordance with the city's urban reality. Torcuato de Alvear, mayor of Buenos Aires between 1883 and 1887, built the Mayo, Alvear and Sarmiento Avenues, as well as public squares and parks, as Haussmann had done in Paris. Work intensified at the turn of the century with the construction of government buildings like the Presidential Palace (also known as "La Casa Rosada") and the Congress, theatres (Colón and Cervantes), shopping centres, train stations, large apartment blocks and private palaces. The eclecticism of Buenos Aires' French roots inevitably became the city's dominant style, against which an anti-academic backlash began. 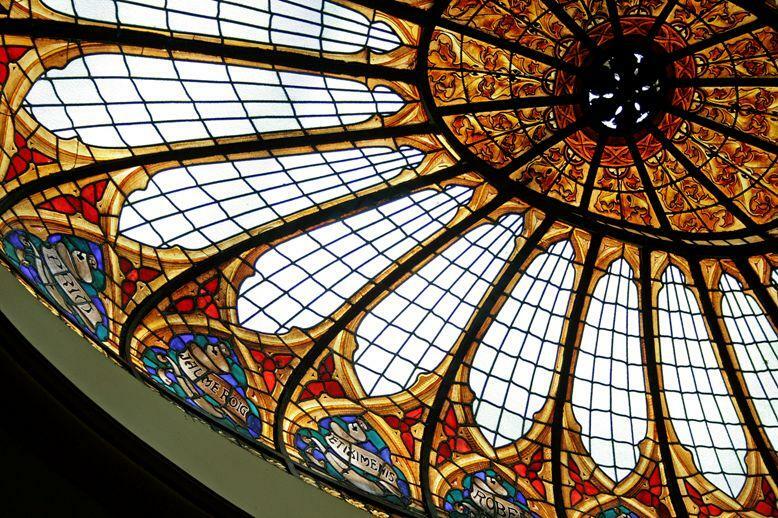 The influence of European Art Nouveau, Catalan Modernisme and the Vienna Secession should also be included in this process, which culminated in the 1920s, when the city enthusiastically embraced the Modern Movement. 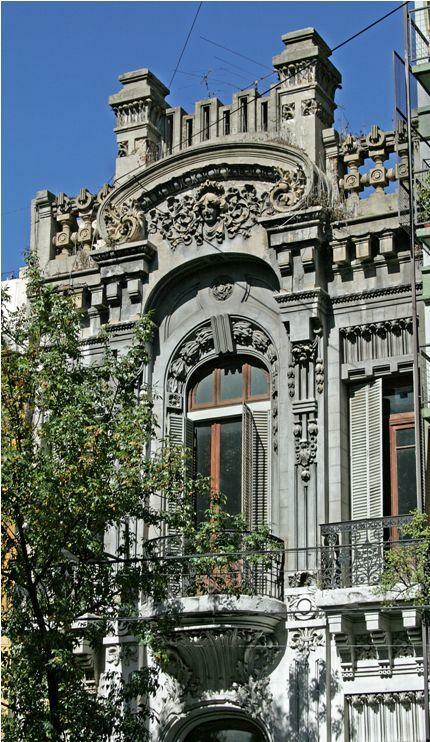 The large presence of Italians in Argentina meant that the city was not only influenced by French Art Nouveau but also by Italian Liberty designs, as can be seen in the Galería Güemes (1915), by the architect Francisco Gianotti, or the Palacio de los Lirios (1905), by the engineer Rodríguez Ortega. 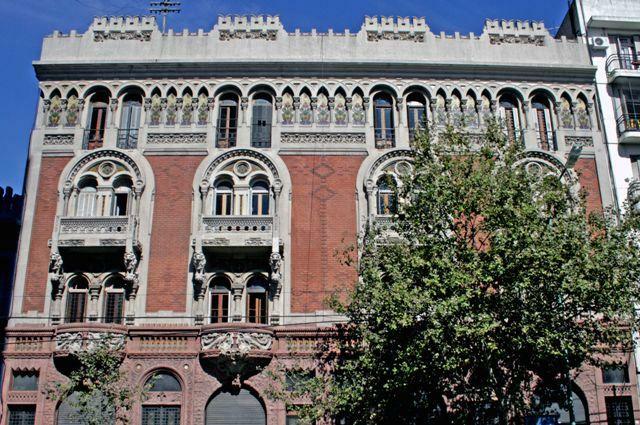 The most prolific architect at the time, Virginio Colombo, was also Italian, and he designed the apartment block at Calle Hipólito Yrigoyen, 2562 (1911), as was Mario Palanti, who designed one of Buenos Aires' most monumental constructions, the Pasaje Barolo (1919- 1923), in a style that is very close to Expressionism. 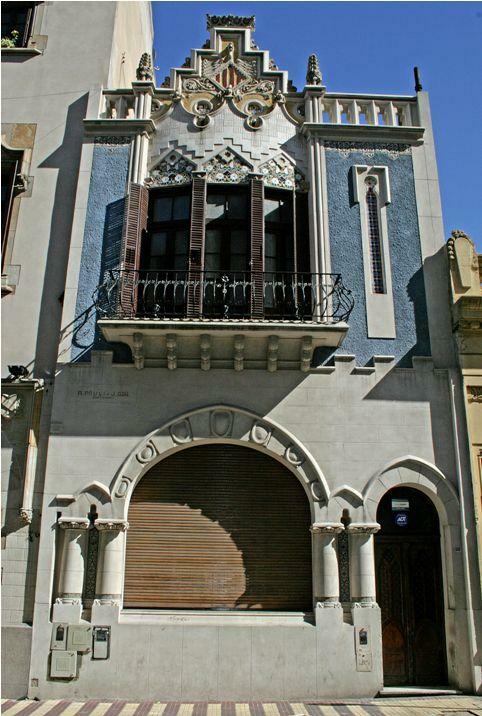 Catalan influence arrived in the form of the architect Julián Jaime García Núñez, who completed his studies in Barcelona in 1900. Highlights of his work include the office block at Calle Chacabuco, 70-78 (1910), with its iron and glass interior courtyard, as well as Secessionist buildings like the apartment block in Pasaje Paso y Viamonte (1913) and the very Barcelona-styled Casal Català (1929), designed in collaboration with Eugenio Campllonch. Also of note is the city's Yacht Club (1906-1913), by Eduardo Le Monnier, a work of daring and unique forms that recalls a large boat entering the harbour. Despite the importance of architecture and design in Buenos Aires' Art Nouveau design, one should not forget other aspects of the city, such as the monumental sculpture found in its avenues and squares, the beautiful mausoleums that were built in La Recoleta Cemetery between 1900 and 1910 or the proliferation of ceramic, iron, plaster or artificial stone work that makes Buenos Aires one of South America's Art Nouveau capitals.